From the summer 1949 issue of The Vegan (volume 5 number 2 pages 13-15). Available as PDF. Learn more about Leslie Cross and the history of veganism. The present stage in the development of The Vegan Society is characterized by a centering of attention upon the implications of the question, "What is veganism?" There is more — much more — behind this disarmingly simple query than at first appears. To begin with, we have to clear our minds of certain assumptions; to realise, for example, that when we say, " Veganism is this, or that," what we are really saying is, “My idea of veganism is this, or that." For there is nothing in the constitution of The Vegan Society which states what veganism is. The fact that the Society has reached its present position without having defined in any precise way the light it attempts to reflect need not disturb us. There were good, if perhaps, unrecognised, reasons why definition should not be attempted until the Society reached a certain point along its road. What, however, must give us food for thought is the growing feeling that such a point is now not far off — that the limited period during which lack of definition is useful and desirable is approaching exhaustion. The way in which our movement may be provided with an agreed definition is, of course, by the majority consent of an annual or special general meeting, and by the inclusion of that consent (in the form of a short definition), either as one of the Society's rules, or as a preamble to the rules, or by some other constitutional device. Although this procedure appears to be a simple one, the task of finding and recognising the right definition is more complicated than might at first be thought. For the Society has evolved a long way in a short time, and if we are to provide ourselves with an adequate picture of what is involved, we must glance at least briefly at the ground we have already covered. In July, 1943, there appeared in "The Vegetarian Messenger" a letter about the use of dairy produce by vegetarians. Correspondence on the subject was maintained for something over twelve months, after which there appeared in the same journal a request, signed by Donald Watson, of Leicester, asking vegetarians interested in living without dairy produce to write to him, and he received about 50 replies. In subsequent negotiations, The Vegetarian Society declined to agree to the formation of a "non-dairy" group within its ranks, and itself suggested such a group might be formed outside The Vegetarian Society. This small group of persons brought together by Mr. Watson thus became the embryonic organisation which eventually became known as The Vegan Society. The Vegan Society is therefore to the present day a group of persons who have come together in response to an intuitive stimulus which has not yet crystallised into words. Although the immediate cause of the emergence of veganism was the compelling desire of a few persons to make their vegetarianism logical, non-dairy vegetarianism was in fact no more than the trigger that released veganism into the world of everyday affairs. The omission of a binding definition of veganism at that date was a historical necessity if it was to have the time it needed to emerge in completeness and strength. It is, however, when we turn away from the past — but without forgetting it — that we are compelled to consider whether the critical point in time at which the entity "veganism" may be said to have emerged fully is not close upon us. If it is, then the conclusion that a definition is now necessary is inescapable. For the Society will be approaching one of those cross-roads which every evolutionary organisation finds itself approaching from time to time. Of the roads ahead, one will be the road of an indefinite "veganism," depending for its meaning upon a host of individual interpretations unchecked and uncheckable by any agreed standard definition; the other the road of a definite, clear and precise "veganism," which shall have the consent and allegiance of every person who joins the Society. 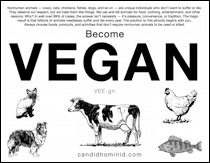 The looseness of organisation which has so far characterised the vegan movement has no doubt been the right type of organisation for the early stages of a movement which seeks to express so new and so vital an idea as that which does undoubtedly lie behind the name "vegan." But if I am right in my view, the significance of the present position is that looseness of organisation and absence of definition are approaching the point at which they not only cease to be useful and even essential, but are in danger of becoming agencies of reaction. If it is true that it was necessary in the early stages for the differing aspects of veganism to be held, as it were, "in solution," it is equally true that if the process is to continue upon its natural course, crystallisation must follow within a reasonable time. Above all else, this means the emergence of an accepted definition of that which gives us being as a Society — a definition which shall be constitutional, and therefore binding upon all who join our movement. The nature of the development of The Vegan Society suggests that the form in which definition should be accomplished is the form of a principle, from which certain practices logically devolve, and not in the form of a set of practices, or aims. At its highest level, veganism cannot be both practice and principle, and to make it a set of practices will involve unending argument as to what type of practices shall be included and what omitted, and will at the same time fail to provide any agreed standard of reference by which their eligibility can be checked. The search for such a principle is not an inventive task, but a voyage of discovery. The principle exists — it is our job to find it, perhaps the most important job we have on hand. If my belief is justified, it is a principle which will one day impact upon the world in much the same way as did the movement to abolish human slavery. I hope, in a subsequent article, to suggest how it may be discovered and — what is perhaps more important — to suggest how it may be recognised as representing the destiny of the vegan movement. But whatever our individual views, we must give thought to this task, for we must be certain that what we finally decide is the best of which we are, jointly, capable.